Knit flowers make great embellishments for clothes and accessories. Learn a few simple ways to make them and doll up a boring shift or dress. 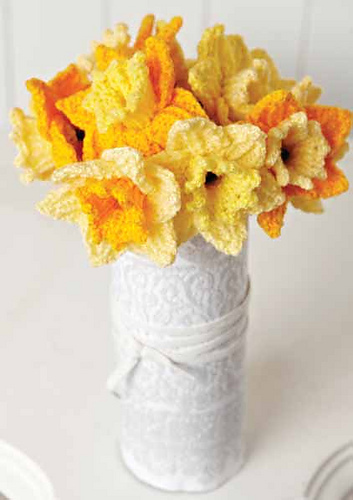 Knitted flowers can also be the centrepiece. A sunflower or a couple of daisies that will never wilt. 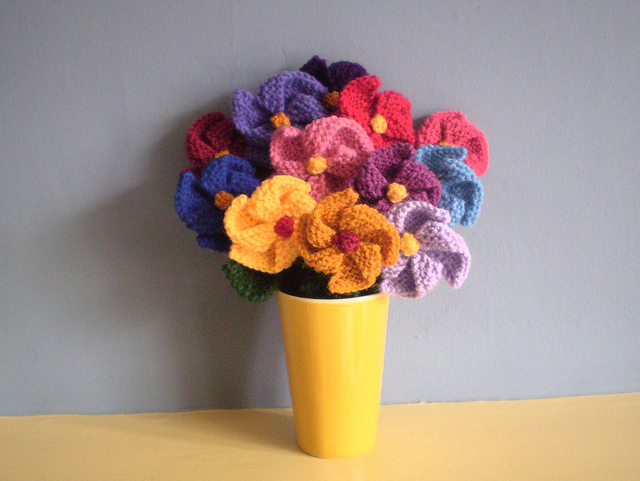 Here are some knitted flowers free patterns. An i-cord flower is quick to make. It is basically knitting one long i-cord, and positioning and stitching them together to form the petals. 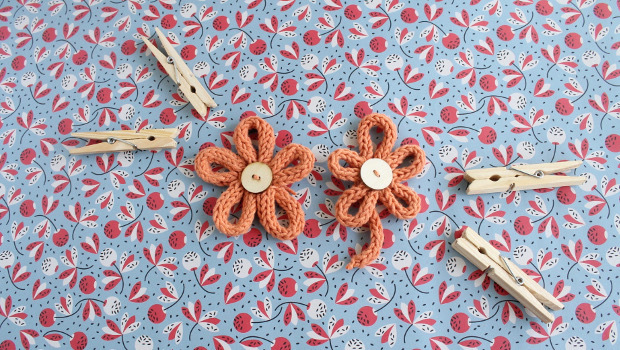 Learn how to make the i-cord and use it in different ways besides making flowers. You can make an i-cord with 2 double-pointed knitting needles or a spool, which is why it is also known as spool knitting or French knitting. You can make a thin or thick cord depending on the yarn you use. Your choice will definitely change the look of your i-cord flower. The instructions at wonderhowto are quite basic but it provides a video. Measure and mark out the petals before sewing or go free-hand like the lady in the video. Get the pattern for 4-petal i-cord flower. The i-cord flower by loveknitting has 5 petals and a little shiny button to represent the pistil. 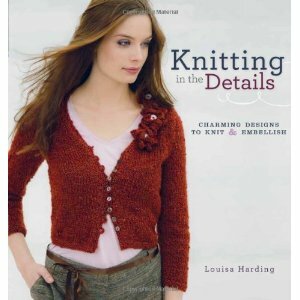 I like the pictures and step-by-step instructions provided by loveknitting. It even uses clothes pegs to mark out the petals so that you get even petals and not lopsided ones. I would definitely use this knitted flower pattern as a stash buster. The pattern is more about making the flowers rather than making the i-cord. Very detailed so that you get perfectly portioned flowers. Get the pattern for the 5-petal i-cord flower. 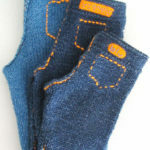 Although this is a free pattern, Julie has put a lot of work and care into writing the pattern. It has all the information that a paid pattern would have. The instructions are clearly written with pictures to go with it. I wonder how the flowers would look using fun fur yarn. Get the pattern for the Knitted flower tutorial at Julie’s website called lovefibres.com. It is a document in Dropbox and you don’t have to sign or register for it. There is an alternate source at loveknitting.com but you have to sign in. This poinsettia is made up of 6 petals, 4 berries, and 4 leaves. Another choice for Christmas knitting beside stocking, Santa hat and candy cane. I think it looks really pretty and a much more environmentally friendly Christmas decoration than the real thing. You can keep and re-use next Christmas. The instructions are straightforward. The hardest instruction is KFB (which means knit into the front and back). 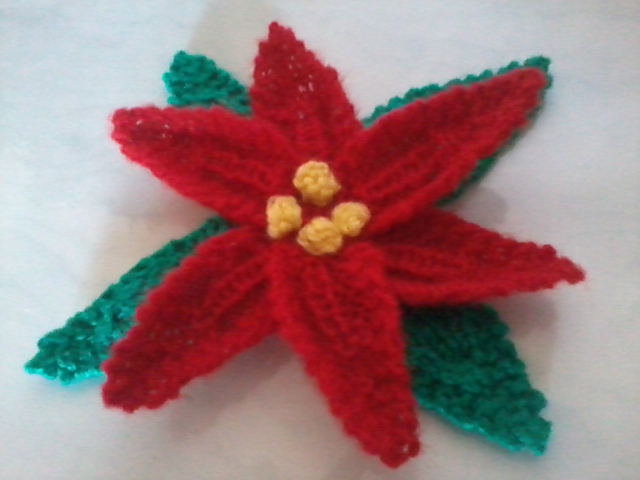 Get the pattern for a knitted poinsettia. I just came across this knitted rosette flower pattern and immediately knew I wanted to knit this. 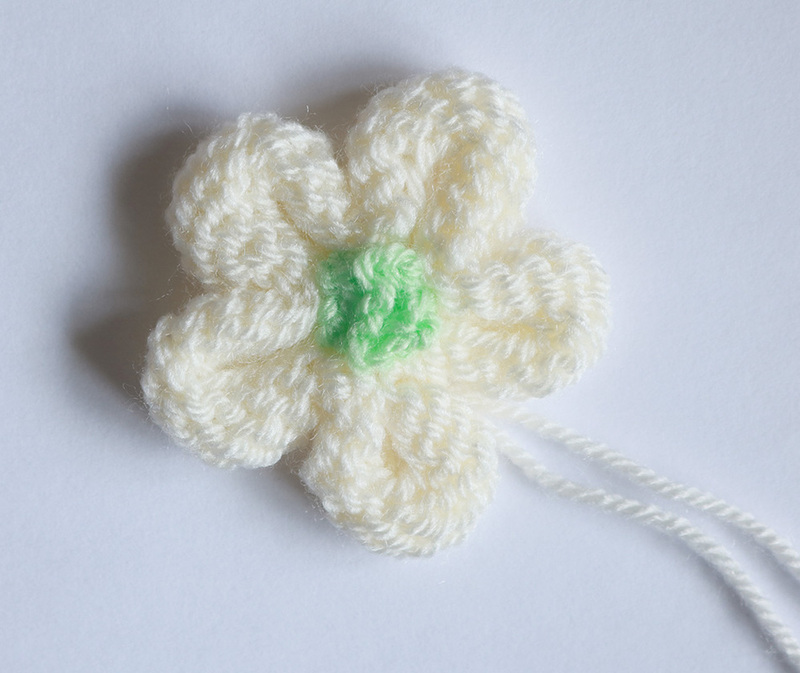 A knitted or crochet flower is so versatile. Sew or glue it onto a pin and it becomes a brooch or pin it to a blouse or sweater as an embellishment. Glue on a plain hair clip and it becomes a hair ornament. Pin or tie it to a bag and jazz it up. Or use it as part of a gift wrapper. The cast on row acts as the edge of the rosette, so if you want to have a nice edge in a contrasting colour, A and B should be of different colours. If you do not want the edge in another colour, just use the same yarn for A and B. In the original pattern, Harding uses a metallic yarn for A.
Wrap next st means to move the yarn to the front of the needle, shift the first stitch from the left needle to the right needle, return the yarn to the back of the needle and return the stitch back to the left needle. This is to avoid any gaps between the turning. With A and larger needles, CO 222 sts. Change to B. Row 3: K54, wrap next st, turn work. Row 4 and all even-numbered rows through Row 14: Knit to end. Row 5: K46, wrap next st, turn work. Row 7: K38, wrap next st, turn work. Row 9: K30, wrap next st, turn work. Row 11: K22, wrap next st, turn work. Row 13: K14, wrap next st, turn work. Row 15: K6, wrap next st, turn work. Row 16: Knit to end. Cut yarn, thread tail through sts on needle, pull tightly to create a rosette, and secure with a few stitches. Amanda’s Sunflower pattern is professionally written. The petals are created using a picot cast-on. Instructions for it is given. 🙂 Amanda provides row by row instructions for each part of the flower. The only tricky part is the making up. If you have never tried putting together a toy or an ornament (as in, all you have knitted so far are scarfs), it might take you a while to study the pattern. 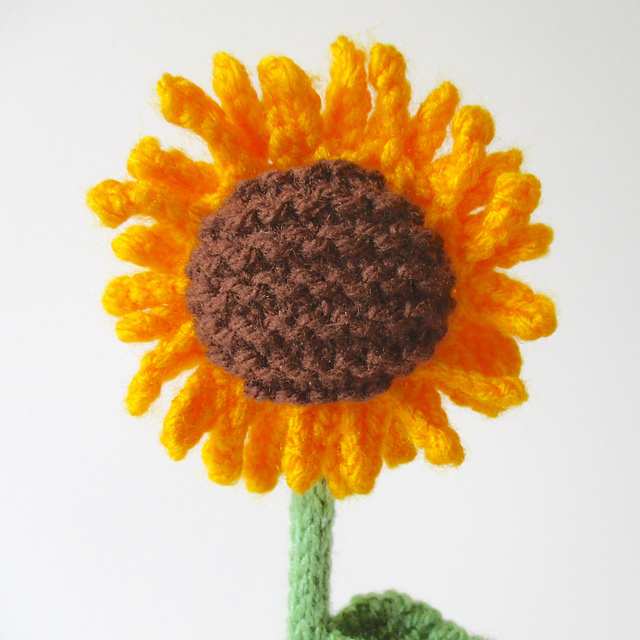 Get the pattern for the knitted sunflower. Can you see that the stalks are knitting needles? What a great way to use excess needles you may have inherited. Andrew designed and knitted these for his mam. The idea is quite simple too. Knit a narrow cup in the round. Pick up stitches along the body of the cup and knit a long strip. Row the strip over the cup like a swiss roll. Variations can be created by varying the way one side of the strips or the width of the strips is knitted up. This makes making up the flower and maintaining the shape easier than if we have just knitted a long strip and rowing it. Brilliant! Andy’s pattern isn’t professionally written up but I think it is good enough. It is available free on his website, “Tall Tales from a small Welshman”. Get the pattern for Flowers for Mam. If you know how to knit garter stitch and make increases by knitting through the front and back (KFB), then you can make these pinwheel flowers. Frankie’s instructions are closely accompanied by pictures illustrating what she means. I don’t see how you can go wrong with this pinwheel flower. You can make them as accessories for your hats, scarfs, bags or dresses or make an entire bouquet complete with stalks and leaves. Instructions provided. The pattern is in a pdf. Get the pattern for Pinwheel flowers. The daffodil is made up of 6 petals and 1 trumpet. Each is knitted separately and sewn together. It can be used as a brooch, just sew in a brooch pin. Or make a dozen and insert pipe cleaners as stalks to make a bouquet. This pattern is a free leaflet prepared by Sirdar Spinning Ltd. It is a typical Sirdar knitting pattern. 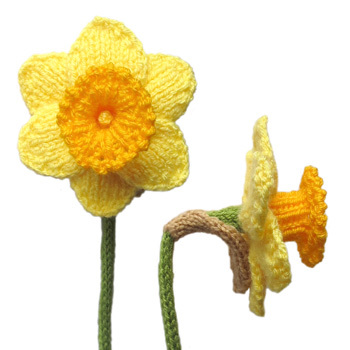 Get the pattern for the Sirdar daffodil. Another daffodil pattern, this time by Jessica Goddard. It is a more precise pattern. There are 4 parts to knit up: the trumpet, petals, spathe (the brown bit) and the stem. Always choose a darker shade of colour for the trumpet. The pattern is free on http://www.oddknit.com/patterns/flowers/daffodils.html and Jessica offers a printable version which is a good idea. The website has a very distracting border. 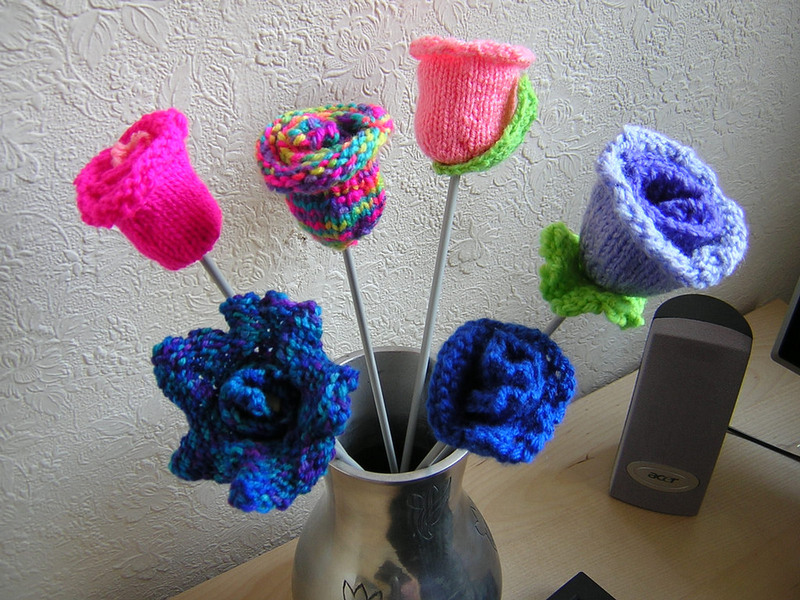 Jessica has quite a good collection of knitted flowers on her website.